In one of the fiercest clashes of the insurrection, Syrian troops finally took control of the town of Rastan after five days of intense fighting with army defectors who sided with protesters. 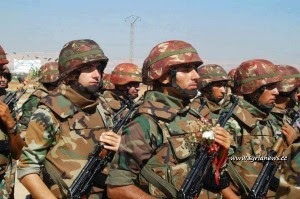 Syrian authorities said they were fighting armed terrorist gangs. In retrospect, and upon examining the obvious lay of Syria’s battlefields today, it is clear Syrian authorities were right. Shortly after NATO carried out successful “regime change” in Libya in 2011 under the false pretext of a “humanitarian intervention,” sectarian-driven mercenaries it armed, funded, and provided air cover for in Libya began steadily streaming into Syria via its northern border with NATO-member Turkey. The meetings came as a sign of a growing ties between Libya’s fledgling government and the Syrian opposition. The Daily Telegraph on Saturday revealed that the new Libyan authorities had offered money and weapons to the growing insurgency against Bashar al-Assad. Mr Belhaj also discussed sending Libyan fighters to train troops, the source said. Today, the West has expunged all rhetoric regarding “pro-democracy,” with sectarian extremism clearly driving militancy across both sides of Syria’s borders with Lebanon and Iraq. Instead, the West has been resigned to attempts in differentiating between groups like Al Qaeda’s al Nusra franchise and its Islamic State (ISIS) counterparts – claiming the latter must be addressed more urgently, even at the cost of cooperating with the former – yet another US State Department designated terrorist organization. And while the fierce fighting in Syria may have began in 2011, the war on foreign-backed sectarian extremism began a generation ago. From 1976 to 1982, Syrian President Bashar al Assad’s father, Hafez al-Assad, waged war on the heavily militarized Muslim Brotherhood. Upon breaking the back of the organization in Syria, it fled and was later reconstituted by the United States and Saudi Arabia into what would become Al Qaeda in the mountains of Afghanistan to fight the Soviet Union. Syria’s President Bashar al-Assad has ruled out the possibility of negotiations with al-Qaeda-linked militant groups, who are the main forces fighting to topple the government in the Arab country. “Regarding the militants, if they give up their arms we’ll be ready to discuss with them anything, like with any other citizen,” he said in an interview with Italy’s state-run Rai News 24 television network on Sunday. He also vowed to abide by the UN resolution calling for the elimination of country’s chemical weapons. “Of course we have to comply. 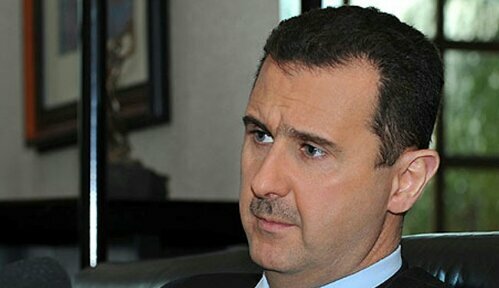 This is our history to comply with every treaty we sign,” Assad said. The UN Security Council voted unanimously on September 27 to pass a resolution requiring Syria to eliminate its chemical weapons stockpile. As the Syrian army is struggling with internal and external threats of wider conflicts, people have been forced to live under strict rules imposed by some of the al-Qaeda-linked militant groups who benefit international silence on their crimes. A US plan to bomb the country over a chemical attack near Syrian capital on August 21 was canceled with Russia’s mediation that sought to ease the tensions by putting Syria’s stockpile of chemical weapons under international control. The offer was widely welcomed both in Syria and other countries that were concerned by US military ambitions and its regional consequences. President Bashar al-Assad said that there are many attempts to distort facts about what is happening in Syria and false accusations, stressing the need to verify the authenticity of the images and reports broadcast about Syria. In an interview with the US channel ABC News, President al-Assad was asked a question about the report of the UN committee on events in Syria and whether or not the UN sent the documents or evidence on which the report was based to Damascus, saying that the Syrian government received no documents or evidence pertaining to what the report described as “crimes against humanity” committed in Syria. He called on the UN to send these documents to verify them, noting that most of the people killed in the events in Syria are supporters of the government, not the other way around. In response to a question on whether he believed that his forces used exaggerated force against protestors, President al-Assad said “The forces in Syria aren’t “my” forces; they are military forces that belong to the homeland and nobody owns them,” stressing that no orders were issued by anyone in Syria to kill or exercise brutality. Regarding external pressure and the west’s statements regarding what is happening in Syria, President al-Assad said that the most important thing for him is how the Syrian people view him, stressing that he is doing his best to protect the Syrian people, expressing pain over the loss of lives in the recent events.